The end of the regular legislative session, April 23, is rapidly approaching. It has been a long time coming, but as discussed last week, the Operating Budget in particular is one item that's not likely to be resolved soon. The budget bills and any other bills deemed “NTIB” – necessary to implement the budget, might need a special session or two to reach final agreement. The last two weeks of this regular session is expected to be a flurry of action to pass the many bills that are subject to the normal cutoff dates. This Wednesday, April 12 is the floor cutoff for bills that have made it all the way over from the opposite chamber and through the opposite house committees. They need to be voted on by the full Senate or House by 5:00 PM on the 12th in order to continue to proceed in the process. The Legislative website offers more detailed information on the legislative process. If you are following a particular bill this session, you might be interested in reading the information about concurrent, dispute, or conference committees. It is surprising, but not uncommon, for bills to die even after being voted off of both floors due to mismatching amendments that cannot be resolved before the last day of session. Last week started with an early Monday morning hearing (April 3) on the House revenue package. The Housing Alliance was proud to sign in pro along with about 30 of our members. Many nonprofits across the state have been doing deep organizing work to move their organizations – including their staff, boards, members, and donors – to a position of full support for a fair, progressive tax system. The many, many nonprofits who took the proactive step to sign in pro on HB 2186/Lytton (D, 40th LD) on Monday signifies this work. This is an important milestone. If this bill was introduced five or so years ago, it would not have been able to garner this depth of support, but due to the work of so many people and organizations across the state, 84 testified pro Monday (vs. 36 con), and another 83 signed in pro (vs. 25 con). Good work! But lawmakers still need to hear more from their constituents about this bill. Some fear political reprisals for a yes vote, so House lawmakers need to hear loud and clear that you support this progressive tax package that shifts the overall cost towards wealthy households, and away from the low- and middle-income households in our state that are currently paying a disproportionate amount of their incomes on taxes compared to the rich. Another big development last week was the release of the House Capital Budget on Wednesday (April 5). It was subsequently heard early on Thursday morning (kudos to the House Capital Budget Committee for being the first in years to give the public more than 3 hours with the budget bill before public testimony). The Housing Alliance and six of our member organizations testified pro because the House Capital Budget invests a bit deeper in affordable housing than the Senate’s budget. Check out the great testimony here and here, and much thanks to everyone who came to Olympia so early to testify! From left to right: Liz Mills, YWCA Seattle, King & Snohomish Counties; Jessa Lewis, Tenants Union of Washington State; Philippa Nye, Ally Community Development; Mallory Hagel, volunteer with OPAL Community Landtrust and Kirk McClain, with the Housing Alliance’s Emerging Advocate’s Program and Capitol Hill Housing. The House Capital Budget proposes $106.37 million for affordable housing, while the Senate budget proposes $99 million. The good news is that since the budgets are not too far apart in this area, ending with the $106 million high water mark shouldn’t be unrealistic. But there are two significant factors to consider. One is that the total House budget proposal is significantly bigger than the Senate’s (by over $155 million). This could mean that negotiations with the Senate result in a smaller final budget. The second is that the House’s proposal is very far from the housing community’s biennial ask of $200 million for the Housing Trust Fund. While this is disappointing, there is still an opportunity to make up for some of this gap in the 2018 supplemental budget. But remember, the supplemental budget is always smaller than the original, so the bulk of our $200 million ask needed to be in the 2017 budget. Despite the disappointing House proposal, it is clear that we now have to unify and work hard to ensure that the final budget ends no lower than the House’s $106 million, and then we will work to get the deepest supplemental investment possible in 2018. And we also need to push to hold on to a big bright spot in the House budget, that wasn’t in the Senate’s: the $39 million for a competitive pool for general affordable housing and homelessness investments. We don’t want that lost during the budget negotiations. Both budgets have similar language that allows the Department of Commerce to use funds allotted to categories for “other low-income and special needs populations” if there are not “adequate suitable projects in a category”. This ensures flexibility and that no money will be left on the table if a specified category doesn’t have enough projects submitted. The House budget has more in project earmarks: $10.09 million vs. $8.4 million in the Senate budget. Each budget has different projects earmarked. The Housing Alliance does not support project earmarks, instead we advocate for a bigger overall competitive appropriation for affordable housing. The Senate budget includes a $6 million set-aside for tiny “homes” projects in Shelton and Orting that is not included in the House budget. Instead the House has a bucket valued at $2.795 M that is for tiny “homes”, but aimed at a chronically homeless population, and without the specific geographic requirement. Click here to access the House and Senate budget bills, as well as summaries of each bill that are prepared by legislative staff. The Leap website also has other helpful information, I encourage you to poke around! Washington Housing Opportunities Act, HB 1570/Macri! One of the most important bills of the session might not be resolved before the end of regular session on April 23. HB 1570/Macri is NTIB (as covered in previous posts) and is still in a position to be enacted this year. But the lines between the House and Senate have clearly been drawn. Between the stark differences in the Operating Budget Proposals by each chamber, and the many good housing and homelessness bills that have been killed by Senate leadership this session, it is absolutely clear that housing and homelessness issues will be serious points of contention during special session negotiations. Representative Ormsby (D, 3rd LD) and chair of the House Appropriations Committee discussed the differences in the budgets on last week’s episode of Inside Olympia. The show starts with an interview with the Senate Budget writer, Senator Braun (R, 20th LD). It is a particularly interesting episode of the weekly show, especially regarding the political and philosophical differences between the House and Senate majority parties that the episode highlights. Stay tuned to the Housing Alliance’s social media for breaking news, and we will continue to keep you updated during these last weeks. Most importantly, please help us ensure that lawmakers continue to hear from constituents about affordable housing and homelessness issues. Your advocacy has been great, but we need to push through together because the legislature is not yet responding to affordable housing and homelessness as if it is a crisis. It is, and we need you to help raise the urgency. Even if you called your lawmaker last week, please do it again. If you haven’t called them recently, please do so today. You can leave one message for all of your lawmakers through the state’s toll free legislative hotline: 1-800-562-6000. It is open Monday – Friday from 8:00 AM – 8:00 PM. Click here for talking points and to sign our pledge to make the call! I recently was asked two related questions that are timely given that the end of session is so near, yet final agreement on the budgets any time soon is unlikely. Question 1: If the legislature knows that it will not be able to finish their budget within the timeframe of the session, why don’t they just agree to change the timeframe instead of going through the drama of declaring special sessions? Question 2: It seems like lawmakers in Olympia rarely finish the budget by their deadline and always need to go into overtime. Wouldn’t it be better if we switched to a full time legislature, instead of holding them to unworkable deadlines? (1) Regular Sessions. A regular session of the legislature shall be convened each year. Regular sessions shall convene on such day and at such time as the legislature shall determine by statute. During each odd-numbered year, the regular session shall not be more than one hundred five consecutive days. During each even-numbered year, the regular session shall not be more than sixty consecutive days. (2) Special Legislative Sessions. Special legislative sessions may be convened for a period of not more than thirty consecutive days by proclamation of the governor pursuant to Article III, section 7 of this Constitution. Special legislative sessions may also be convened for a period of not more than thirty consecutive days by resolution of the legislature upon the affirmative vote in each house of two-thirds of the members elected or appointed thereto, which vote may be taken and resolution executed either while the legislature is in session or during any interim between sessions in accordance with such procedures as the legislature may provide by law or resolution. The resolution convening the legislature shall specify a purpose or purposes for the convening of a special session, and any special session convened by the resolution shall consider only measures germane to the purpose or purposes expressed in the resolution, unless by resolution adopted during the session upon the affirmative vote in each house of two-thirds of the members elected or appointed thereto, an additional purpose or purposes are expressed. The specification of purpose by the governor pursuant to Article III, section 7 of this Constitution shall be considered by the legislature but shall not be mandatory. (3) Committees of the Legislature. Standing and special committees of the legislature shall meet and conduct official business pursuant to such rules as the legislature may adopt. Regarding the question about whether it would be better to have the legislature convened full-time… it wouldn’t address the problem of when the legislature is able to reach agreement on a final budget. The state budgets are biennial and expire after two years. Regardless of how long the legislature is allowed to convene, lawmakers still need to get the Operating Budget done before the current one expires. In this case, agreement must be met by June 30 2017. Feel free to submit your questions about the legislative process by emailing reinyc@wliha.org. Lastly, the annual Conference on Ending Homelessness is almost here! Join us May 10 and 11 in Tacoma for two action-packed days of learning, networking, self-care, and movement building. The early bird registration rates expire on April 25 – sign up soon, and also be sure to reserve your hotel room before they fill up. Learn more about the conference here. 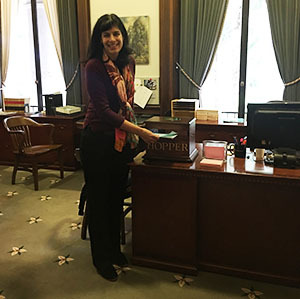 Last week was very busy in Olympia with the release of two new budget bills and another cutoff. With Sine Die (the last day of the regular session) rapidly approaching on April 23, the pace in Olympia won’t slow down any time soon. The budgets introduced last week included much better news for affordable housing and homelessness than the Senate’s Operating Budget (which was released the prior week and was detailed in last week’s blog post). The House Operating Budget was a net positive for affordable housing and homelessness, and the Senate’s Capital Budget proposal came in much higher than normal for the Housing Trust Fund ($96.572 million). Once the House releases their Capital Budget bill on Wednesday, all budget proposals will be out. It is unclear if budget negotiations are already underway between the House and the Senate, but regardless it is not expected that compromise will be reached before April 23rd. The Housing Alliance is pushing for the adoption of the House Operating Budget and for both chambers to get much closer to our Housing Trust Fund ask of $200 million for this biennium. What is it? HEN provides rental assistance and access to basic sanitary items for extremely low-income, temporarily disabled adults. Senate Budget: The original budget proposal completely eliminated all funding for HEN, but it was amended to include $10 million for the program. This amounts to a cut of over 80%. House Budget: Fully funds the program, plus creates a new transportation stipend. Beginning in July 2018, $10 per month is provided to cover the cost of travel expenses for Housing and Essential Needs recipients. What is it? ABD provides cash assistance (currently $197) for extremely low-income, permanently disabled adults, and SSI facilitation services to assist in obtaining federal benefits. Senate Budget: Per SB 5898/Braun, the Senate’s budget assumes savings from a new 35-month time limit for receiving the ABD cash grant, which would terminate the benefit for approximately 2,400 individuals. House Budget: The House budget fully funds the program and also increases the monthly cash grant beginning in July 2018, from $197 per month to $227 per month. What is it? Washington has finalized an agreement with the federal government for a five-year demonstration that allows innovative uses of Medicaid dollars to improve health, provide better care, and lower costs. Under the demonstration, the state will receive up to $1.5 billion in federal investments. The demonstration includes investments in Permanent Supportive Housing Services impacting the health and well being of people with disabilities experiencing long-term homelessness. Senate Budget: Suspends the state’s ability to move forward with the demonstration and rejects $1.5 billion federal dollars to serve the health needs of low-income Medicaid recipients. House Budget: Provides budget authority for the state to move forward with the demonstration and accept the federal funds. What is it? The Young Adult Shelter program provides Emergency, temporary shelter, assessment, referrals, and permanency planning services for young adults ages 18 through 24, and the Young Adult Housing Program provides rental assistance. Senate Budget: Eliminates all funding. What is it? TANF provides modest cash assistance to extremely low-income adults with dependent children. Senate Budget: Eliminates approximately $96 million from the TANF program, plus over $44 million from the Working Connections Childcare Program. House Budget: Adds over $12 million to increase the cash grant by 8% starting in July 2018 (for example, a grant for a family of 4 is raised from $613 to $662). This budget section also increases the grants for State Family Assistance and Refugee Cash Assistance by 8%. Funds are added to account for HB 1831/Pettigrew, which raises the asset limit caps that applicants to TANF, HEN, and ABD can have in order to qualify for the programs. The bill allows for a higher maximum value of a vehicle, and for a person to have slightly higher amounts of “liquidable cash” including in their kids’ savings accounts, a burial plot, 401Ks, etc. Funds are added from the General Fund to provide new rental assistance resources for homeless families ($1 million) and for funding for permanent supportive housing services ($6 million). Funds are added to assist youth exiting state institutions to find housing ($3 million from the General Fund, plus an additional $1 million from the Home Security Fund). The last budget to be released is the House Capital Budget. The House Capital Budget Committee has said that it will release its budget proposal on Wednesday, April 5 and will hold a hearing on it at 8:00 am on Thursday, April 6. The Senate budget set funding for the Housing Trust Fund at $96.572 million, and added an additional earmark for an affordable housing project to bring the overall affordable housing investment to $99 million. We hope that the House will come much closer to our biennial ask of $200 million. We need to get as close as possible in order for the 2018 supplemental Capital Budget appropriation to be able to feasibly close the gap to end the biennium with $200 million. The Housing Alliance testified last week on the Senate’s Capital Budget with thanks for the historically high starting point, but we noted that it was still far from our total ask. You can watch our testimony here. Keep watching for the next panel of three stellar advocates who also testified from Plymouth Housing, the YWCA of Seattle, King and Snohomish, and from the Tacoma Pierce County Affordable Housing Consortium. Tuesday the 4th marks the next cutoff – all bills must clear the opposite chamber’s fiscal committee in order to keep moving (unless of course it has that special “NTIB – Necessary to Implement the Budget” status which exempts it from cutoffs). And then next week, April 12, brings the big floor cutoff. All bills must clear the opposite floor by that date in order to keep on moving towards the governor’s signature. Keep connected to the Housing Alliance emails and social media for breaking news over the next couple of weeks. As things heat up and move more quickly in these final weeks, big decisions will likely be made. We will continue to keep you informed. The next advocate’s call is scheduled for Friday, April 14 at 11:00am. We provide detailed updates in this hour-long call for all affordable housing and homelessness advocates. Just email Reiny for the call in number and code: reinyc@wliha.org. Lastly, we had no new submissions for our “Ask a Lobbyist” column this week. But if you have a question you’d like to ask about the legislative process, about lobbying in Olympia or about the politics impacting affordable housing and homelessness… ask away! We’d love to answer your questions. Just submit your question (and note we will keep your identity anonymous) to Reiny at reinyc@wliha.org. The Senate introduced their Operating Budget last Tuesday (March 21st) mid morning, and then conducted the committee hearing on it just hours later. The Housing Alliance testified con (you can watch testimony here). The budget proposal from the Senate Republicans completely eliminated the Housing and Essential Needs program, suspended the state from accepting $1.5 billion federal dollars for Medicaid innovation (including approximately $200 million for Permanent Supportive Housing services), it earmarked over $30 million of existing homelessness funds for programs that used to be funded out of the general fund, and assumed savings from a proposed new time limit on the Aged, Blind, and Disabled program. It also eliminated funding for the homeless student stability act, for young adult shelter and for young adult housing programs. Funds were swept from TANF (Temporary Assistance for Needy Families) for other programs and new requirements were put on the extremely low-income families who apply for TANF benefits. The budget was an attack on homelessness and anti-poverty programs, which was especially troubling given the recent Trump budget release which also proposed extremely deep cuts to affordable housing, homelessness, and human services. Despite this grim budget proposal, the good news is that it caused an uproar from advocates and from housing champions in the Senate. The uproar led to an amendment in the Ways & Means Committee by Senator Miloscia (R, 30th LD) which restored $10 million in funding for the Housing and Essential Needs Program. This still amounts to a cut of over 80% to this critical safety net program, which provides rental assistance to temporarily disabled, extremely low-income adults. More than forty additional amendments were offered by Democratic members of the Ways & Means Committee. The amendments offered would have restored funding to the safety net. Almost all were rejected, with the partial restoration of HEN by Senator Miloscia being the shining anomaly. The bill was voted out of committee with all Republicans voting yes, minus Senator Miloscia who voted no with every Democratic member. The bill was then sent to the Senate Floor. Next, the Senate as a whole considered the bill on Thursday night. After hours of deliberation the bill was voted out of the chamber on a party line vote. Again, Democrats offered many amendments to restore the safety net. One by Senator Nelson (D, 34th LD) to restore funding for the Homeless Student Stability Act was adopted. The amendment restores $2 million in funding from the General Fund to this program, which addresses the needs of homeless public school students and their families. This amendment came at a time when homelessness is rising among public school kids in our state. In the last school year, the state identified over 39,000 students as experiencing homelessness. This recent article by the Kitsap Daily News highlights the importance of the homeless student stability act. Senator Darneille (D, 27th LD), author of several committee and floor amendments to restore funding for HEN, ABD, TANF and homeless youth. Senator Nelson (D, 34th LD) for restoring funding for the Homeless Student Stability Act. Senator Billig (D, 3rd LD) for introducing amendments to restore funding to Working Connections Childcare for TANF families. Senator Frockt (D, 46th LD) for introducing an amendment to fund higher ed grants from a source other than TANF. Senator Miloscia (R, 30th LD) for introducing a successful amendment to partially restore funding for the Housing and Essential Needs program. The House is set to release their Operating Budget proposal (SHB 1067) on Monday afternoon (March 27th) and hear it a little later the same day. The Housing Alliance will be testifying to weigh in on how key budget priorities are treated, including HEN, ABD (Aged Blind and Disabled) and the Medicaid Innovation Demonstration. Next the Senate will introduce their Capital Budget, most likely on Tuesday (March 28th). The Capital Budget funds the Housing Trust Fund so we are eagerly waiting its release. The House is expected to release their Capital Budget in the week of April 3rd. More on the safety net programs under attack: Housing & Essential Needs (HEN) and the Aged, Blind, and Disabled Program (ABD). These programs comprise the heart of what is often referred to as “disability lifeline”, assisting disabled and extremely low-income adults. As Senator Darneille, 27th LD, said on the Senate floor on Thursday night, “every one of us needs a helping hand at some point in our lives.” Housing and Essential Needs provides rental assistance and access to an essential needs bank where people can get basic sanitary items. The Aged, Blind, and Disabled (ABD) program provides a cash grant of up to $197 per month. People cannot be on both programs at the same time and DSHS determines which program they are eligible for. If someone is deemed to have a permanent disability and likely to qualify for federal social security benefits, they are offered ABD. If someone moves from HEN to ABD because their disability status changed, they often face homelessness because of the loss of the housing assistance. This is just one problem with these safety net programs that needs to be fixed, but instead we often find ourselves fighting for the very preservation of the programs themselves because of attacks on them. The Senate’s budget adds a new time limit on ABD, which would terminate benefits for approximately 2,395 people in the first month the time limit is implemented. On Thursday night, the Senate also passed a corresponding bill, SB 5898, to implement this change in statute and to implement other harmful changes to TANF and to Working Connections Childcare. The Housing Alliance testified con on the bill in committee. To learn more about these safety net programs, check out this excellent work session from Friday. 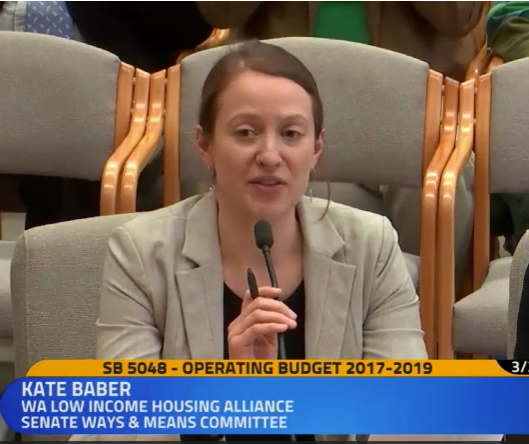 The Housing Alliance’s Kate Baber organized the work session, which was requested by Representative Kagi (D, 32nd LD), chair of the House Early Learning & Human Services Committee. 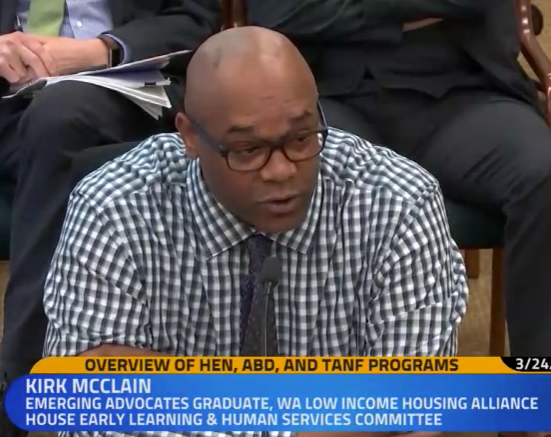 The work session provides an overview of HEN, ABD, and TANF and features Housing Alliance 2015 Advocate of the Year, Kirk McClain. Kirk shares his story of homelessness and how HEN helped him by providing a path into housing (Kirk’s part starts at about 52 minutes in, followed by Kate who discusses the implications of the Senate’s budget proposal). In addition to the budget and the associated budget bills, a couple of other important bills were also introduced last week. SB 5911 by Senator Nelson (D, 34th) would invest $60 million into homelessness services, including HEN rental assistance, $95 million into the Housing Trust Fund for housing for people experiencing homelessness, and $5 million for the Operations and Maintenance of affordable housing. The bill is strategically tied to a strategy in the Senate’s budget that uses “rainy day” funds to cover a specific item in their budget ($700 million needed for a public employee retirement plan). A 60% vote is required to transfer money from the rainy day which means that Democratic votes will be required to pass this central component to the Republican’s budget bill. The bill was referred to Ways and Means. SB 5903, the “housing for all act” was introduced by Senator Darneille (D, 27th LD). Key elements of the bill include the elimination of the sunset on the Homeless Housing and Assistance surcharge and an increase of $50. It would also make the Housing and Essential Needs program an entitlement and double the ABD cash grant for the biennium. The bill creates a new local sales tax option for chemical dependency, mental health, and housing services for people experiencing homelessness. The bill was referred to the Senate Human Services, Mental Health and Housing Committee. This is a timely question given that the legislative budget proposals are now rolling out. The Washington Housing Trust Account is a budget account for the Department of Commerce that is legally set up to accept funds for certain purposes, including for the Housing Trust Fund and for administration of the Housing Trust Fund program. Loans for affordable housing development that are paid off also go into this account. The Housing Trust Fund is a program created in law that is subject to appropriations from the Capital Budget. Each year, the Housing Alliance advocates for new investments into the Housing Trust Fund to expand the state’s supply of affordable housing. The Department of Commerce has several different accounts under its authority that are used for certain purposes. One of the things that make the Operating Budget bills difficult to read is that there is often a lot of fund transfers from one account to another, making the overall impact on affordable housing and homelessness difficult to discern. The main accounts we watch are the Housing Trust Account, the Home Security Fund and the Affordable Housing for All account. Again, the Housing Trust Account holds funds for purposes related to the Housing Trust Fund program. The Home Security Fund is where the money from the Homeless Housing and Assistance surcharge goes, and the Affordable Housing for All account receives funds from the original $10 document recording fee, often referred to as “2060” reflecting the bill number which created the account and the program back in 2002. These funds generated by the 2060 surcharge can be used to provide housing and shelter and operations and maintenance for affordable housing programs serving extremely low-income people and related programs. Commerce accounts are often raided by the legislature for earmarks for specific programs, which has particularly impeded the ability of Commerce to provide operations and maintenance support over the years. We are now over two-thirds of the way through this 105-day legislative session. Over 2000 bills are already dead for the session. If a bill is dead, since it is the beginning of the two-year budget/bill cycle, it will be able to start the process over in 2018 without being reintroduced. But there is also a saying in Olympia that a bill is never really dead until “sine die”. Sine die, basically meaning “adjournment”, is called to close a legislative session. Even if lawmakers are called back for a special session, they will call Sine Die by (or before) April 23, which is the last day allowed for this session. 1473 bills have been introduced in the House (an average of 15 per Representative). 566 of those House bills have been passed out of House committees. 376 of them have been passed out of the House, and are now in the Senate. Two House bills have already passed the Senate. 1297 bills have been introduced in the Senate (an average 26 per Senator). 484 Senate bills have been passed out of Senate committees. 283 of them have been passed out of the Senate, and are now in the House. Four Senate bills have already passed the House. The Legislature is set to release budgets this week: action needed! The state Senate will be the first to release their budgets this year. The Senate Republicans are holding a press conference on Tuesday, March 21 to discuss their Operating Budget proposal. They are expected to release the Capital Budget a little later in the week. Once the first legislative budget is out, hearings will begin. The Housing Alliance will be weighing in with either concern over cuts to safety net programs or with thanks if our budget priorities are protected. The House is currently expected to release their budgets next week (during the week of March 27). Watch this blog and Housing Alliance social media for updates on the budget proposals and for urgent action requests. In the meantime, now is a critical time to weigh in with lawmakers with a request to fund the Housing Trust Fund at $200 million. This week is the last week to influence the Capital Budget proposals before they are finalized and released. 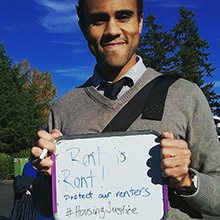 We need a groundswell of voices asking for the Housing Trust Fund to be prioritized. Please take action today and ask your board, your colleagues, and other networks to join you. Washington State Budget & Policy Center on why lawmakers need to implement new revenue this session, even considering last week’s positive revenue forecast. His priorities are clear. In order to significantly increase military spending, make a down payment on his wall, and fund school vouchers, the President has proposed deep cuts that would devastate communities across the country and take life saving services away from people who rely on them. His proposal cuts HUD by 13%, or $6.2 billion compared with 2016 levels. Compared to funding levels needed for 2017, the budget is a $7.5 billion, or 15% reduction. The President’s budget eliminates Community Development Block Grants that provided $51 million for housing and infrastructure in Washington in 2016 and the HOME Investment Partnership program that provided $19 million to our state and local communities to build and preserve affordable homes. It also eliminates Choice Neighborhood grants, the Self-help Homeownership Opportunity Program, and the Section 4 Capacity Building Program. Legal Aid – which helps low-income tenants avoid unwarranted evictions and remove barriers to rental housing. US Interagency Council on Homelessness – which coordinates the federal response to homelessness across 19 agencies and reduced homelessness among veterans by half since 2010. LIHEAP – which heats the homes of low-income seniors and families during the winter. While this budget is just a starting point, and has critics among both Republicans and Democrats in Congress, fighting it is one of the most important things we can do right now. Because the budget is so extreme, there is a risk that restoring some high profile programs and adopting smaller cuts could be seen as a reasonable compromise. Given the enormity of the housing affordability crisis in Washington and across the country, any significant cuts will increase homelessness and cause greater suffering. Archive of all NLIHC webinars, including one from Monday, March 20, which provides an overview of the budget proposal and advocacy needed to defeat it. Potential impact on housing programs in Washington state if the Trump budget were enacted. Additionally, if you are part of an organization, you can sign onto a letter telling Congress to protect affordable housing and transportation funding. We will continue to update you on progress and opportunities to make your voice heard. Ask a Lobbyist: What is a “Special Session”? According to the book Sine Die by Edward D. Seeberger, Washington voters adopted a constitutional amendment in 1979 that provided for the current legislative calendar which sets a 105-day “regular” session during each odd-numbered year and a regular 60-day session in each even-numbered year. Prior to that, sessions were held every odd-numbered year and were limited to just 60 days. We are currently about two-thirds of the way through the regular 2017 105-day session, which must adjourn no later than April 23. And an Operating Budget for the next biennium must be finalized (voted on by both chambers and signed by the Governor) before July 1 – the date that current budget expires. If the legislature is not done with the budget process by April 23, they will need to be called back for an additional session. If they are unable to finalize it within that first special session, they will be called back for another. Each special session can last no more than 30 days and can be called by the Governor (which is most common) or by a two-thirds vote of all members of the legislature. Even though they are called for 30 days at a time, they can adjourn before the 30 days are up. Usually during a special session, only budgets and items that are necessary to implement the budget can be considered. Special sessions have become very common in recent years, with the 2015 session requiring several in order to reach agreement between the House and Senate on the final budget. That year, it took until June 30 to reach final agreement, with the Governor signing it just hours before the deadline. It is assumed that budget deliberations this year will be hard and will require at least one special session. The Housing Alliance will keep advocates updated on all budget deliberations, so if a special session is called, you will know. Have a question? Ask a Lobbyist here. Two major cutoffs have come and gone, and Thursday (March 2) marks the halfway point of this 105-day legislative session. In order to still be viable, bills must have cleared the policy and/or fiscal committees in their chamber of origin, either the House or the Senate, unless they are given the special status of “NTIB”. NTIB means necessary to implement the budget – see last week’s “Ask a Lobbyist” column for more on NTIB. The good news is that many affordable housing and homelessness bills are still alive, including top priority bills SHB 1570/Macri and HB 1633/Riccelli. Download this comprehensive bill tracker for the status of the many affordable housing and homelessness bills introduced this session. We’ve also included bills that we are opposing, and important bills we are supporting that will improve the safety-net, will prohibit discrimination, and will improve the lives of low-income households, people of color, and immigrants. This top priority bill cleared two major hurdles last week when it was given a hearing and then a vote in the House Appropriations Committee. The hearing on Thursday, February 23 featured three stellar testifiers; Realtors Tonya Hennen and Sol Villarreal, and Debbie Trosvig from the Snohomish County Human Services Department. All three passionately shared why it is imperative that Washington lawmakers take action to prevent over 60% of the Homeless Housing and Assistance Surcharge from expiring, and that local communities have the opportunity to increase the surcharge. The two realtors shared that there is a clear nexus between real estate activity and homelessness. They also shared that the surcharge does not discourage home ownership and that many new homeowners are in fact happy that they can help ensure that people in their community have a roof over their heads. This testimony was particularly striking in the face of the Washington Realtors testifying “with concerns”. After the hearing, the bill was quickly added to the list for “executive session” (when a bill can be voted out of committee) and on Friday evening it was voted out on a party-line vote. If one of your lawmakers sits on the House Appropriations Committee and voted yes (see the list below), please send them a quick email to thank them for their leadership and to encourage them to vote yes again on the House Floor! And if your lawmaker voted no, please email them to let them know that you are disappointed and that you hope that they will reconsider their position and vote yes when it comes up on the House Floor. The following lawmakers voted yes on SHB 1570 on Friday, February 24 in the House Appropriations Committee. Please thank them, especially if they are your lawmaker! You can call their office directly or email them. These lawmakers voted no on SHB 1570 on Friday, February 24 in the House Appropriations Committee. If you see your lawmaker on this list, please contact them to ask that they reconsider their position and vote yes when the bill comes up on the House Floor. House bill (HB) 1633/Riccelli, Outlawing Discrimination based on Renter’s Source of Income. This top priority bill cleared another hurdle last week when it was “pulled” from the House Rules Committee to the House Floor Calendar for a “second reading”. Bills have to clear three “readings” in each chamber to pass the legislature. The first reading happens to all bills introduced when they are read on the floor and referred to a committee. If the Rules Committee moves a bill out, they technically open it up for a second reading. During second reading a bill can be amended. It is during the third reading that a bill is brought up for a vote on the floor. HB 1633 is now in second reading status and therefore could be placed on the “order of consideration” at any time. The order of consideration is a list of the bills up for a vote on the floor. From now till 5:00 pm on March 8th, both chambers will spend a lot of time on the floor passing bills out. HB 1633 must move out of the House by that date in order to be considered by the Senate. Since its companion bill (SB 5407/Frockt) died in the Senate policy committee, don’t be surprised to see amendments passed on the floor to better position it for support by Republicans who control the Senate chamber. Ask A Lobbyist: How often can I contact my lawmaker? In our second “Ask a lobbyist” column, we tackle the question of how often an advocate can contact their lawmaker and still be an effective advocate. We get this question often, especially during busy legislative sessions like this where there are many affordable housing and homelessness issues on the table. It comes up even more often when an advocate wants to contact a lawmaker more than once on a the same bill or same budget issue. Because this comes up often, the Housing Alliance has asked many different lawmakers for their perspective. And each time we ask, lawmakers, regardless of their political party, answer the same way - they want to hear from their constituents! You can contact them on the same issue, or on different issues, as often as you want. The key is how you communicate, not how often. Respectful communication with your lawmakers, even when you are expressing your dismay with their position, is totally acceptable. Repeated communication with your lawmaker on the same issue is also totally acceptable, especially if the issue is still pending (e.g. a bill hasn’t yet been brought up for a vote). In fact, being persistent is a very good thing. It communicates to your lawmaker that the issue is of upmost importance to their constituents, and that you will be closely watching for how they vote. So don’t be shy or hesitant to contact your lawmakers often. Being persistent can often be the key to developing a relationship with your lawmaker – once you develop such a relationship, they may even reach out to you to ask where you stand on a issue. Thank you for being an advocate for affordable housing and homelessness. Our movement is strong and thanks to our persistence and strategic advocacy, we have consistently been able to move mountains and achieve the impossible. Please help continue this tradition by taking action this week! And please consider attending your local lawmaker town hall meetings. Many lawmakers are hosting in-person or telephonic town halls and your voice is needed! Check out this page for a list of town halls and for a guide to asking your lawmakers to stand up for affordable housing and homelessness issues this session! Olympia is in the midst of cutoff craziness, with everyone scrambling to get their bills officially “heard” and voted on before Friday’s looming deadline to clear fiscal committees (see all session deadlines here). Once bills have passed the policy and fiscal committee hurdles, they next have to be pulled from the Rules Committee to the Floor. Then they have to get called up for a vote before the next “house of origin” deadline set for March 8th. If a bill makes it over to the opposite chamber, it goes through the whole process again over there. A bills journey is arduous, from its origin as an idea, to the final step of being signed into law by the Governor. It needs cheerleaders and advocates pushing it along, encouraging it to not give up and reviving it with first aid when needed. And right now, a key affordable housing and homelessness priority needs some of that love. The Washington Housing Opportunities Act (SHB 1570/Macri) will prevent the loss of over 62% of state homelessness dollars by eliminating the looming sunset on the Homeless Housing and Assistance Surcharge (commonly known as the document recording fee). It will also increase resources to prevent and end homelessness by providing counties with a new local option to increase the surcharge by as much as $50. 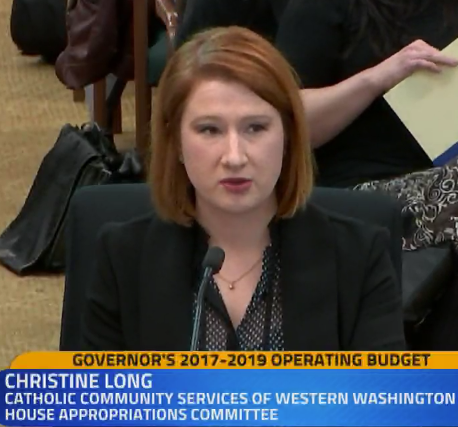 If each county council takes up the opportunity, and if the state invests deeply in the Housing Trust Fund, Washington could end family homelessness in 3 years. We could also prevent any youth from being released from state care into homelessness and we could reduce chronic homelessness by at least 50%. This is a real, tangible solution to the suffering that so many will otherwise face. Our lawmakers can do it. SHB 1570 can pass this session. It is largely contingent on how much of a fuss we make. We need to raise our voices and push the bill through the next hurdle. Please take action today to help end family homelessness! If you’ve taken this action already in the last couple of days, can you get three other people to do it too? Send them the link to the action page and tell them that their voice can truly make a significant difference. Many lawmakers, both locally and at the state level, are asking why homelessness has increased in our state. They wonder if the resources they’ve already authorized are being wisely used and they want to know if they can reduce homelessness by investing more deeply in the Homeless Housing and Assistance Surcharge and in the Housing Trust Fund. These are all legitimate questions, so the Housing Alliance was happy when we were asked to address them before the Senate Ways and Means Committee on Thursday, February 16th. Below are some of the key points we shared with the committee members. If you want more details you can watch the hearing here. You can also download our PowerPoint presentation and our briefing paper on the increase in homelessness. There is a great need for permanent, affordable housing in every community in our state. Homelessness is a crisis impacting many people. Homeless has serious consequences on a person’s health & safety, on their ability to obtain or maintain a job, and on a child’s ability to learn. 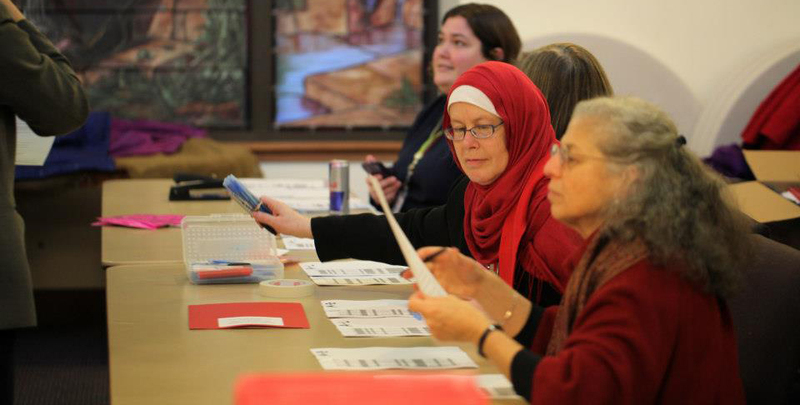 Each January, every county conducts an annual “Point in Time” count. While counts were just conducted for 2017, we don’t yet have the results. We do know that in 2016 that 20,844 people were identified as experiencing homelessness and 8,474 of them were unsheltered. The annual “Out of Reach” report, conducted by the National Low Income Housing Coalition, finds that rents in most counties in Washington far exceed what a worker earning the state minimum wage of $11 can afford. And a 2015 study on Washington’s Affordable Housing Needs found that the majority of households who are earning less than 50% of the area-median Income are “cost-burdened” in our state. This means that they are paying more than they can afford housing, causing households to wrestle with impossible choices between paying the rent or paying for childcare, medicine or a doctor’s visit. This also leaves households at great risk of homelessness, with no safety net or savings for a rainy day. The State Office of the Superintendent (OSPI) recently reported that during the 2015-16 school year, 39,671 students experienced homelessness. Over 10,000 of those students were living in a temporary shelter, motel or in setting not fit for human habitation. 39,671 equals one in every 27 students in our state experiencing homeless during that school year. About half of them were grade 5 or younger. OSPI’s report also noted that the four-year graduation rate for homeless students in the class of 2016 was 53.2 percent; while for all students it was 79.1 percent. And that students of color experience much higher rates of homelessness than their white counterparts. 9.5% of African American students experiences homelessness. Housing costs have risen dramatically across the state, while incomes are not keeping up. And rent increases are directly correlated with homelessness. A recent study in the Journal of Urban Affairs found that for each every $100 increase in rent, that there was a 15% increase in homelessness in metro areas and a 39% increase in homelessness in suburban & rural areas. While the drivers of homelessness continue to include mental illness and chemical dependency, the main cause of homelessness is the lack of affordable homes. The underlying reason Washington has seen an increase in homelessness is that housing has become increasingly unaffordable, while wages are stagnant and too many are living in poverty. Our state has already been investing in solutions that work. While homelessness has been rising in recent years, it has still decreased by 18% since 2006, after the Homeless Housing and Assistance act was passed. Currently, 98,000 people each year are not homeless because of services funded by the Homeless Housing and Assistance surcharge. But our state can and should do more. Specifically we need to invest $200 million this biennium in the State Housing Trust Fund and pass SHB 1570. This is a new column we are adding the Advocacy in Action blog with a goal of making space to answer questions about the legislative process. If you have a question, submit it here! Many people are wondering why some bills have to go through both a policy and a fiscal committee, and what “NTIB” means. Since these questions directly pertain to SHB 1570/Macri, the Washington Housing Opportunities Act, these are good ones to start this new column off with. Bills that have both a policy and fiscal impact will often have to go through two committees before being able to reach the Rules Committee (the final step before the floor). If the fiscal impact of the bill is considered insignificant, usually meaning under $50,000, then it usually will be allowed to skip the fiscal committee and head straight to Rules after passing the policy committee. If a bill’s primary purpose relates to the budget, it will often skip policy committees and go straight to the fiscal committee. The session cutoff calendar sets deadlines for bills to clear all these steps. You can see all the cutoff dates here. The Senate Ways & Means Committee deals with all fiscal related bills, expect those directly related to the Transportation budget (those go to Senate Transportation). The House has several different fiscal committees. House Finance deals with tax related bills, House Capital Budget considers all Capital Budget related matters, House Appropriations deals with all matters related the state’s Operating Budget and House Transportation deals with the Transportation Budget. Bills that are considered “necessary to implement the budget” or NTIB for short, still have to go through the process, but they are exempt from the cutoffs. The state budget bills are the most obvious example of an NTIB bill. But other bills can also be considered NTIB if they are needed in order to finalize the budget. Whether or not the bill is needed is a matter of opinion and there is a fair amount of discretion that leadership can wield with this designation. Declaring something NTIB inherently signals that the bill is important to leadership. Many bills that could impact the budget are not given this designation and it is a status not given lightly. If the other chamber doesn’t also consider a bill NTIB, it may still have to get over there in time to adhere to their deadlines. SHB 1570/Macri is considered by House leadership to be NTIB because it impacts the Department of Commerce’s budget. Therefore, if the bill doesn’t move along by the cutoff deadlines, it doesn’t mean that it is dead. It is scheduled for a hearing this week, Thursday February 23rd in the House Appropriations Committee but likely won’t be brought up for a vote until the next week or so. We hope this is helpful. If you have questions you’d like us to tackle in our next blog post, please send them in! And don’t forget to take action and to encourage others to join you. For the last several weeks in Olympia, affordable housing and homelessness has been top of mind. Many bills impacting these issues have had hearings, and of course, over 650 advocates came to the capitol on February 2nd for Homelessness and Housing Advocacy Day. The week of February 13 marks the beginning of the 6th week of this legislation session. Scheduled to end in April, we are about 1/3 of the way through and Friday February 17 brings the first cutoff. Successive policy hurdles called “cutoffs” segment the state legislative session. The first one requires that bills clear policy committees by getting a hearing and then a vote by the cutoff date. The next cutoff pertains to fiscal committees. Bills with a fiscal impact have to be heard and voted on by February 24. You can see the whole legislative calendar and all the cutoffs here. 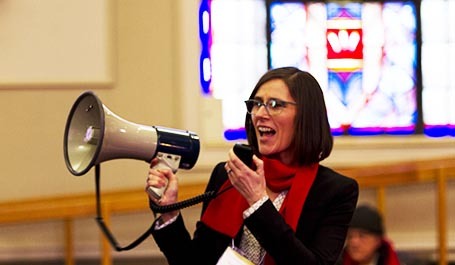 The Olympian recorded Representative Macri addressing Affordable Housing and Homelessness advocates during the rally and you can watch it here. Especially near policy cutoffs, when so many bills are competing for the limited time and bandwidth of the legislature, your lawmakers need to hear from you. 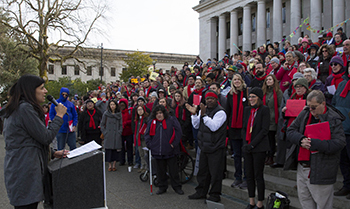 During the rally on the Capitol Steps on Homelessness and Housing Advocacy Day, Representative Marcri (D – 43) and Senator Saldaña (D – 37) both urged advocates to do more to make our voices heard. They both spoke about how many emails and calls they get each day on a wide range of issues. They shared that while affordable housing and homelessness are top-of-mind for them, it isn’t because their constituents are reaching out. They both came to Olympia caring deeply about our issues, but they are not hearing enough from their constituents. This suggests that lawmakers who need to be swayed are unlikely to be hearing from their constituents either. As Representative Macri shared, “We’ve got to amp up the volume. We need more calls, more emails, more demands!” So please TAKE ACTION NOW and ask your lawmakers to support a ban on source of income discrimination. These actions really do work! And don’t stop there. Share this with your boards, with your colleagues, with your friends, your networks, and your families. Tell them why you took action and encourage them to join you. On February 7, testifiers braved the snow and ice to come to Olympia to urge lawmakers to vote yes on HB 1633/Riccelli. Patricia Abbate, Solid Ground/ Claude DaCorsi, Auburn City Council and the Affordable Housing Advisory Board/ Megan Hyla, King County Housing Authority/ Toya Thomas, Section 8 Housing Choice Voucher tenant/ John Hannaman, Section 8 Housing Choice Voucher tenant/ Michael Mirra, Tacoma Housing Authority/ Dimitri Groce, Washington Low Income Housing Alliance and Tamaso Johnson, Washington State Coalition Against Domestic Violence. The last two weeks have been action-packed. Lawmakers in the House and the Senate in three different committees have heard testimony on the need to pass SB 5407/HB 1633 banning source of income discrimination. Over 25 individuals have come to the Capitol to testify on the harm that this kind of discrimination causes to households and communities. People directly impacted by this discrimination have shared their stories, including Toya Thomas who was told to move from her Renton home this fall when a new property management firm took over her apartment building. All the section 8 families were told to go because they were using vouchers to help pay the rent. Most were single parent headed households with young children and most were African American. You can learn more about Toya’s experience through a recent KCTS 9 feature on the ordeal. The Housing Alliance and our allies also weighed in last week against a bill that would repeal local fair housing protections. SB 5569/Angel would undo all of the local laws that have outlawed discrimination based on a renter’s source of income and would prevent any city or county from passing any local protections (it would also repeal Seattle’s protections against discrimination based on political ideology). If the bill were to pass, it would leave the state as the sole fair housing protector. Proponents of this bill represent the same organizations working to block passage of state level source of income discrimination protections. And even though the bill begins with the premise that fair housing is so important that it should solely be a state duty, the intent is clearly to prevent such protections by any means possible. Thank you for all you do. Please help us to “ramp it up” so that lawmakers know that their constituents want them to prioritize our issues. My name is Elimika James, and this year was my very first time at Housing and Homelessness Advocacy Day! As a working single-mother, it can be difficult to find the time to be an advocate while balancing a job, being a parent, and taking care of my own needs, and I appreciated the opportunity to participate. I recognize that I have a lot of friends and family members who are struggling to keep their homes and some people need to be given a voice. It energizes me to be able to speak up on behalf of people who don’t have the opportunity. I heard about Advocacy Day through the Tenant’s Union. This fall I was introduced to the world of housing advocacy when I had helped the organizing effort to prevent many households in my community from being evicted because they used a Section 8 voucher to pay their rent. Our organizing pushed the City of Renton to pass a temporary injunction protection for tenants who use Section 8; but it is set to expire this summer, and I don’t want to see anyone else go through this. At Advocacy Day, I saw that this is just one of many important issues in a larger problem of access to affordable housing. For instance, my rent has increased over $400 this year without warning. More needs to be done to keep rents affordable—landlords should be able to reasonably raise the rent, but I think that there needs to be more limitations on that power, and more resources to keep people from becoming homeless. The opportunity to meet with my lawmakers really struck me. I remember going to Olympia as a kid, but that was just to learn and spectate. At Advocacy Day we actually sat down with public officials to have a genuine conversation with them. I spoke with Representatives Hudgins and Bergquist from my district—there were about 5 or 6 of us, so it was really personal. When we talked about banning source of income discrimination, they said they verbally supported it, but there were many challenges to get it through the legislature that made their role tricky. This was a little discouraging because they have the final decision. But I guess that is why this kind of advocacy is so important. We, as advocates, were able to talk to them about how Section 8 is stigmatized and affects our lives. Seeing people that care enough to come all the way out to Olympia to talk about what it is important to them might motivate lawmakers to change their minds. Overall, I think the day made me feel like I could make a difference. Standing with people from across the state during the Rally for Homes reminded me of the scene in the movie "Lean on Me" - together we were powerful. I plan to be back next year to learn more and get more information on important issues and how to advocate. Since the Legislative session kicked off two weeks ago, I have sat through two budget hearings with the folks at the Housing Alliance, done email blasts, signed petitions, marched, and met with so many inspiring people that it makes my head spin. We’ve waited through four hour-sessions to give two-minute testimonies and sat at our desks compiling email addresses to send out requests for the support of low-income housing and care. All of this, in support of the effort to ensure access to safe, healthy, affordable homes for everyone in Washington. There are some incredibly intelligent, talented Representatives and Senators supporting this cause but they have a lot of issues vying for their attention. This is where the job of advocates like us comes into play. While you and I know that financial and housing assistance programs like Housing and Essential Needs (HEN), Temporary Assistance for Needy Families (TANF), and Aged, Blind and Disabled (ABD) are important, it is up to us to remind the House and Senate of this fact. Speaking up about these issues is important but it can seem overwhelming. How do you get started? A great activist recently told me that you should gather like-minded folks together and set small, daily goals. Find a part of this larger cause that you are passionate about and set a daily goal of writing a postcard or email to your local officials. 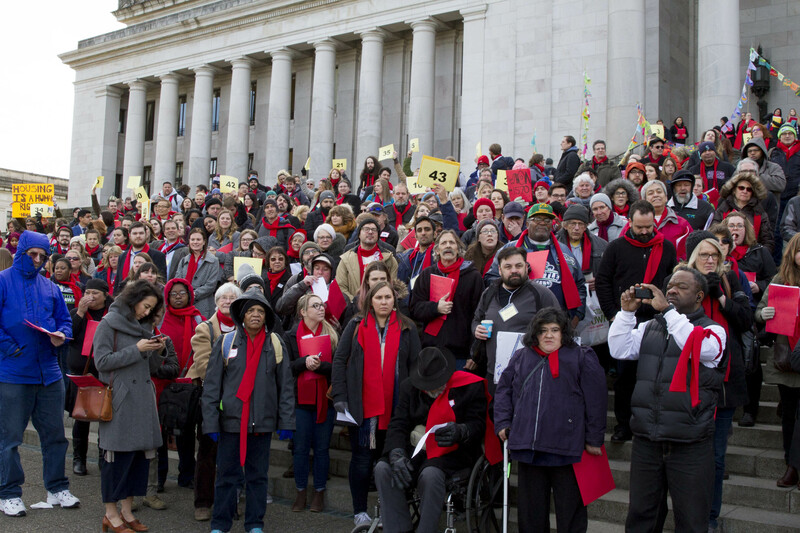 The next day, make a phone call to your Senator or Representative’s office and plan to take part in one of the many advocacy days happening in Olympia over the next three months. The important thing is that you get out and testify; send postcards, emails, call your Representatives and Senators, make your voice heard. We may get the word out in different ways but we all support the same issues and the more testimonies we present, asking for the same, larger goals, the more attention we will get. I would like to share the testimony I gave before the House and Senate on the HEN Program as an example of how easy it is to get started. If you have something to say, we want to hear it and so do the people in power. So get writing! Good Afternoon Members of the Committee. I am Christine Long, Program Manager for Catholic Community Services Housing and Essential Needs in King County. I am here today to thank you for your continued support of this program as a crucial social service, providing housing, rental assistance, move in costs, transportation and hygienic needs for nearly 2,000 people per month in King County alone and now nearly 10,000 in total as we enter our 6th year. When surveyed, 83% of our clients who entered as homeless are now housed. It is because of your tireless work here, that we are able to provide these lifesaving services. This year, the Governor’s budget includes a $20 per month transportation stipend for clients to travel to local agencies to access basic necessities. I commend the office on this proposal and urge your support of this as it will be of tremendous benefit to those counties with limited transportation funding and for continued funding for those counties who have existing transportation programs, such as King County. We also applaud the Governor for eliminating the Asset limit for TANF and the ABD programs and we encourage the House and Senate to eliminate the Asset limit for Housing and Essential Needs as well. I respectfully ask that the Governor’s budget to be approved through the House and Senate with these additions. If you’re not sure who represents you, click here for a detailed list of officials and addresses by city. The 2017 state legislative session is 2+ weeks in and many bills are still being introduced. The pace and feel of the campus is hectic, with many people working to get their issues in front of lawmakers. To keep track of all the bills this session, the Housing Alliance has created a bill tracker on our website where we will list our position on bills that impact affordable housing and homelessness, and other important issues including racial equity, voting rights, safety net services and more. Be sure to check back often, as we are updating this all the time! Do you want to testify this session? We can help! Testifying on a bill can be an empowering experience that helps to educate lawmakers on the need to pass a bill or to invest in a program. Especially if you have a personal experience with an issue, your story can profoundly impact where a lawmaker stands. Let us know if you are interested in learning more or if you are already planning on coming down to testify. Fill out this simple survey and we will be in touch! Last week was exciting with the development of HB 1570 by Representative Nicole Macri from the 43rd legislative district. This bill will prevent a massive cut in state homelessness funding while also increasing resources to meet Washington’s growing homelessness crisis. Ensure that no youth exits a public institution into homelessness. You can TAKE ACTION today to make sure your lawmakers know how important this bill is! Eliminate the sunset on the homeless housing and assistance surcharge. This sunset would result in a loss of 62.5% of state funds to prevent and end homelessness. Every homeless and housing safety service in the state would be deeply impacted by this cut, including services for victims of domestic violence, youth & young adults, families and people with mental illness, seniors, veterans and more. HB 1570 eliminates the sunset and makes this fund-source permanent. Increase resources to prevent and end homelessness by adding $40 to homeless housing and assistance surcharge. This would bring this total surcharge to $90. These are charged when real estate documents are recorded with the local auditor’s office. Real estate documents are recorded in a variety of instances, including when a house is sold. Amends the mandate that currently requires 45% of all state funds be set-aside solely for for-profit landlords. The for-profit market is difficult, and sometimes impossible, for low-income tenants exiting homeless because of the outright refusal of for-profit landlords to rent to people using rental assistance to help pay the rent. This discrimination limits the effectiveness of rental vouchers, while the lack of rent controls in Washington also make private rental vouchers an increasingly expensive intervention. HB 1570 will provide the state and counties with flexibility to use vouchers in nonprofit owned housing where tenants exiting homelessness are welcome. Improves state and county reporting requirements. HB 1570 will also improve reporting requirements to ensure more transparency in how state homelessness dollars are being spent, including by requiring homeless housing plans to be updated every five years. You can find the bill on this page and sign up for updates as the bill progresses. Last week we all witnessed the historic shift of power to a new administration. A Trump White House could have very significant impacts on affordable housing and homelessness. Ben Carson, the Trump administration’s pick for HUD (Housing and Urban Development) does not have a history of supporting affordable housing programs. While his lack of experience in this area generally makes the impacts of his appointment unknown, there will likely be significant alignment between his conservative worldview with the policy priorities of congressional leadership. This could have significant budget implications, but it could also impact HUD’s fair housing enforcement, regulations that protect public housing tenants and more. The Housing Alliance encourages you to sign up for alerts from the National Low Income Housing Coalition. This organization has a long history of informing housing and homelessness advocates on federal developments. You can sign up on their website here. I also encourage you to check out this blog post from after the November election in which they outline the potential impacts of Trump. In these uncertain times, it more important than ever that we stand up against hate, discrimination and attempts to weaken fundamental protections. To that end, the Housing Alliance has crafted a support agenda that reaches a little further to include issues that impact poverty, racial justice, immigrant rights, voting rights and other important issues that effect justice and equality in our state. You’ll see us taking action on more issues this year, while still leading on affordable housing and homelessness priorities. Check out our lead agenda and support issues here. Check out the Housing Alliance website for advocacy resources including policy overviews for each of our priority issues. Additionally, you can find key resources including this Housing Trust Fund talking points document. Note: our one-pager on the Medicaid Transformation Demonstration is coming soon. Housing and Homelessness Advocacy Day is around the corner, and many of you have not yet registered! We know you are coming, but we need you to register so we can order the food and plan all the logistics of the day including ensuring enough room for lawmaker meetings. Please register today. If you have questions or need help, you can contact Alouise at the Housing Alliance. We are also still looking for volunteers, including people who will lead the lawmaker meetings. If you are interested in volunteering, the first step is to fill out this form. 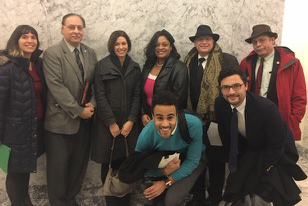 Help us educate lawmakers with stories from people impacted by homelessness, discrimination or housing insecurity. The Housing Alliance is in the process of creating a one-page document for each legislative district in the state that will include data about housing and homelessness, and a personal story of someone whose life is better because they have a safe, affordable home. The stories are approximately 250 words with a picture. Because session has already started, we need these stories as soon as possible for our lawmaker meetings! If you have a story to share, or if you know someone who does, please email dimitrig@wliha.org and he can coordinate with you! Join us every-other-Friday at 11am for a conference call detailing the very latest on housing and homelessness priorities in Olympia. These calls will cover progress of important bills and advocacy opportunities, and you don't have to be a policy expert to follow what's happening. The next call is on Friday, February 3rd, followed by calls on 2/17, 3/3, 3/17, 3/31, and 4/14. Anyone can join, just email reinyc@wliha.org for your call in code. Feel free to invite your colleagues, friends, and family to join. - Michele and the Housing Alliance team.